Quiche! It’s what’s for dinner. Or breakfast. ‘Cuz it’s got a potato crust! Who doesn’t appreciate a good quiche? Exactly! 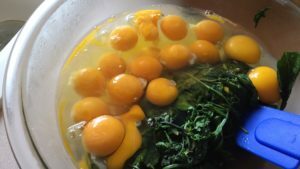 So when I posted a photo on Facebook of the local greens and eggs I was using to make 3 quiches (yep, that’s 3), and when friends asked about the recipe, I thought, “why not share this deliciousness with the rest of the world?”, which led to this photo/recipe/post! I started with these gorgeous greens from local Evansville farmers Clint and Brandi at Aficionado Farms. This mixture of green goodness, called Energy Mix, contains small leaf kale, chard, and spinach. 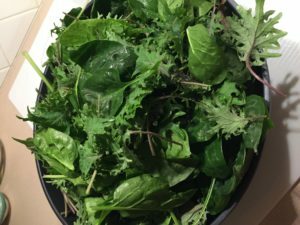 Because the greens were still moist having been recently picked, no oil was needed–I only had to toss them in a pan with chopped garlic and salt until they wilted. Ah, those eggs! Isn’t the color of the yolk positively dreamy? They came from the very happy and healthy chickens on Turning Point Farm in New Harmony, IN, about 40 minutes up the road. I mixed 18 of those jewels into the sauteed greens. Next up was the roasting of the veggies. Easy-Peasy –> just toss veggies of your choice with olive oil and salt/pepper. Bake at 350 for 20 minutes total, stirring things up at the 10-minute mark. The secret to this fabulous quiche is the potato crust, which is super easy and fun to make! Shred red potatoes and purple onion in a food processor; mix with egg whites; add salt and pepper, then bake. Bam! And while the crust is baking, that’s your window to be making the filling and roasting the veggies. The recipe below will provide the details so you too can create potato crust magic. Layer the roasted veggies into the finished crust and ladle in the filling. Note that the filling will ooze down into the cooked crust, before more baking. That’s a good thing! Here are the masterpieces, assembled, prior to baking. Preheat the over to 400 degree; oil a 9-inch pie pan. Combine grated potato and onion, salt and egg white in a bowl, and mix well. Transfer to an oiled glass pie pan, pat into place, building up the sides. Bake for 30 minutes, then brush the crust with olive oil, and bake it for 10 more minutes. Remove from oven, and turn the temperature down to 375. While the crust is baking, roast or sauté the veggies lightly, and set aside. Sauté the greens, and set aside. 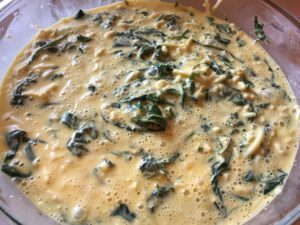 Beat the eggs, add the cheese and cream, and blend well. Add the greens. Season with dill, salt and pepper. Remove the baked crust from the oven, line with sautéed veggies; pour over the egg mixture. Bake for 45 minutes, checking at 30 minutes; if the top is getting brown, cover with foil for the remaining of baking time. Test doneness with a sharp knife in the center; it should come out clean. Let the cooked quiche set for a few moments before cutting. Yum! pre-heat the oven to 400.
cut the head of cauli into 1/2 inch thick slices. Small pieces will break off of the slices, no worries–they’ll taste just as fabulous! place the slices on a cookie sheet or flat pan. drizzle with olive oil, spreading the oil around on both sides. sprinkle with a pinch of salt and pepper. bake for 5 – 8 minutes, turn the pieces over, and repeat. Enjoy the rich, buttery taste and crunchy texture! Let the kids pick up the slices with their hands to bite off delicious mouthfuls! 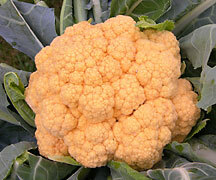 Note: I’ve been bringing home orange cauliflower whenever I find it at Briarpatch, my local natural foods co-op. It’s got a fuller flavor than it’s white cousin and offers an intriguing viewing variation. 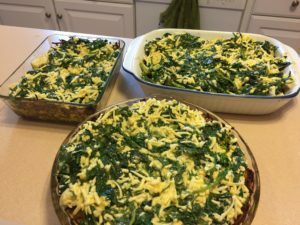 This delightful side dish was introduced to me by my colleague and friend, Wendy Van Wagner of In the Kitchen. 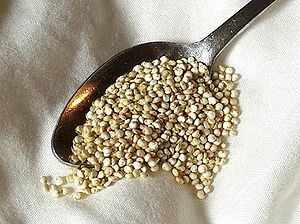 Quinoa is a super nutritious grain, chock-full of protein and fiber. 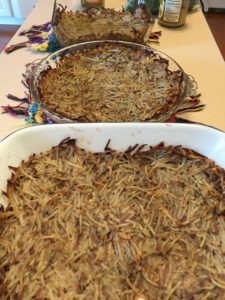 The nutty flavor and slightly crunchy texture make it unique, either as an ingredient in a salad or casserole, or as a hot breakfast cereal. It cooks more quickly than most other whole grains–just 12 to 15 minutes–an important fact to remember to maintain the crunch. 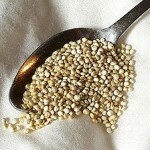 Enjoy the following recipe for one of my favorite ways of cooking and savoring quinoa. Bring water to a boil, add quinoa, turn down heat to simmer for 12 – 15 minutes. When the grains are cooked, add a bit of garlic infused olive oil to prevent them from sticking together. Chop the basil and garlic. Chop the olives in half. Mix it all up gently (cooked quinoa is fragile! ), let it sit in the fridge for a few hours. Place the pine nuts in a non-stick pan, cook on low, constantly stirring to prevent burning; add these right before eating (so they do not become soggy!). Note: Pine nuts are fabulously rich, adding not only a divine flavor to this or any dish, but are also a good source of mono- and poly- unsaturated fats and protein. 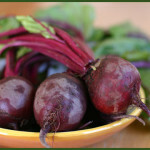 Wash and wrap beets in foil, bake at 400 for 60 minutes. Let cool completely (several hours). 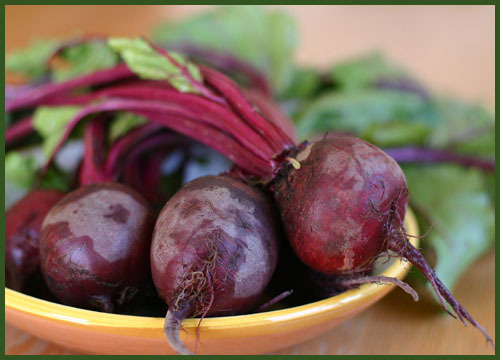 Wearing kitchen gloves, rub the beets gently and the skin will fall right off. Clean up the beet tips. Chop into bite sized chunks. Add crumbled blue cheese, chopped turkish apricots and (optional) just a few candied pecans. Drizzle with good quality balsamic vinaigrette (I used fig) and sprinkle a tad of salt and pepper. This dish can be eaten at room temperature or cold from the fridge in the summer. Enjoy! Pour a bunch of salsa or chili verde sauce into the bottom of a 9 x 13 glass casserole dish. Place 3 tortillas on top of the salsa or sauce. Cover with ½ of the cheese. Sprinkle on the cilantro and olives. Top it off with a healthy dousing of salsa or chili sauce. 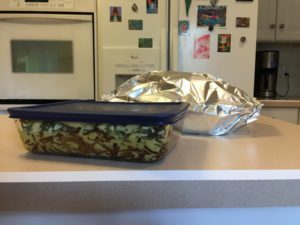 Cover with foil and bake at 350 for 28 minutes. Remove foil, sprinkle on remaining cheese and bake 2 more minutes. Top with a lot of cabbage at the table for added zip and crunch. This dinner is so quick, so yummy, and so simple, that you won’t even mind that it is a complete protein, high fiber, and low fat meal! My choice is to shop at our local co-op for all canned or prepared items; I buy organic and I recommend you consider this as well—there will be no added fats, coloring, sweeteners, preservatives, etc. Having said that, the point here is to have a quick and delish dinner, you should buy whatever you think is best. You already know that I am not a recipe user. I love free flow creativity in the kitchen. This dish can have virtually anything you want to put in it that you and your family like and that maintains the Mexican or Spanish flavor. And of course, you can leave out any of the ingredients that don’t thrill you. Finally, I sometimes buy a bunch of rice to go with this dinner. There’s a fab little Mexican place in town, called Tortilla Grill, which uses all organic ingredients for their rice and beans. It makes me feel better to bring that kind of rice home for an easy side dish to an already simple dinner. The big box food stores sell cooked Mexican or Spanish style rice also, again your choice. Occasionally, if I am feeling really sassy, I will throw the rice into the casserole, on top of the beans to bake into the cheesy goodness! 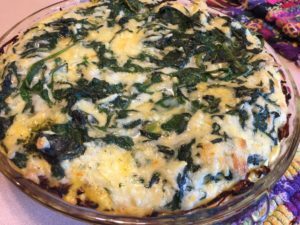 Enjoy this meal—it is one that kids and spouses like—if you have them around the house—and either way, you’ll love it because of the ease and taste! Yes! Another soup recipe being offered to you, for a quick, yummy, and healthful dinner. 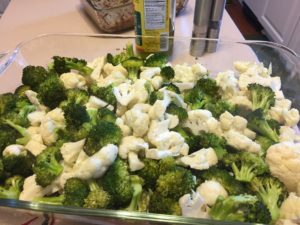 Place all of the chopped veggies in a glass casserole dish; toss with olive oil, sprinkle with salt and pepper, and roast for 20 minutes at 350 degrees. At 10 minutes into the roast, stir up the veggies, then finish the roast. Set aside. While the veggies are roasting, cook the pasta just to an al dente texture, and consider enjoying a glass of wine. Drain the pasta, saving the water to thin the soup stock, and set the pasta aside for a moment. In your soup pot, mix the tomatoes, beans and the roasted veggies, pour in 1/2 cup of red wine, and add the spices to meet your palate desires. Add about a cup of the pasta water. 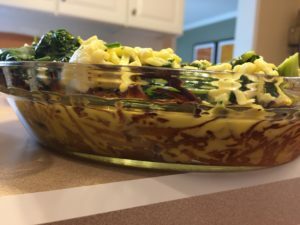 I’ve learned over the years to cook just enough pasta to put 1/2 – 3/4 cup cooked into the bottom of each soup bowl, then ladle the soup on top. If the pasta is added to the soup pot, it tends to get mushy, especially when you reheat the leftovers later. Enjoy! This is a rich, high protein and fiber, delicious dinner. For an easy side dish, I saute greens with garlic in olive oil, or I’ll slice a good quality baguette, layer the slices with swiss cheese, and broil for 3 minutes or until the cheese is bubbling and yummy. Or I make both side dishes! "Robin Mallery has been working with me for over a year now. During this time, she has introduced me to many different thought and choice options--most importantly she has helped me understand that I am the most important choice. Her passion for living right and feeling even better brings a human support to a process that could easily have been uncomfortable and unsuccessful. She is tireless in her unending support. Her talent for listening heightens a nurturing coaching relationship. I recommend Robin for those that have chosen to change; she will help support that decision, and you will be pleased that you chose to change and that you chose Robin as your coach."